At Venice Hotel, located in Vladivostok airport, you will find one of the safest, cleanest and most service-oriented establishments in the Russian Far East. Its strategic location is convenient for both transit passengers and business people traveling to the largest cities of the Russian Far-East and overseas. Our guests do not worry about the flight time: Venice Hotel is conveniently located in Vladivostok airport, 100 meters from the airport terminal buildings. Venice Hotel is located in Vladivostok airport at 50 kilometers (40 minutes drive) from Vladivostok down town, «Airport» station for suburban train. 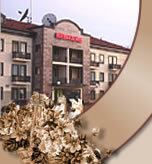 The hotel provides car with a driver to any destination of the Russian Far East by advanced order. All guests and visitors of Venice Hotel have toll free access to the airport area (the only formality is to stamp your entrance pass at the Front Desk). The parking is located nearby the hotel.